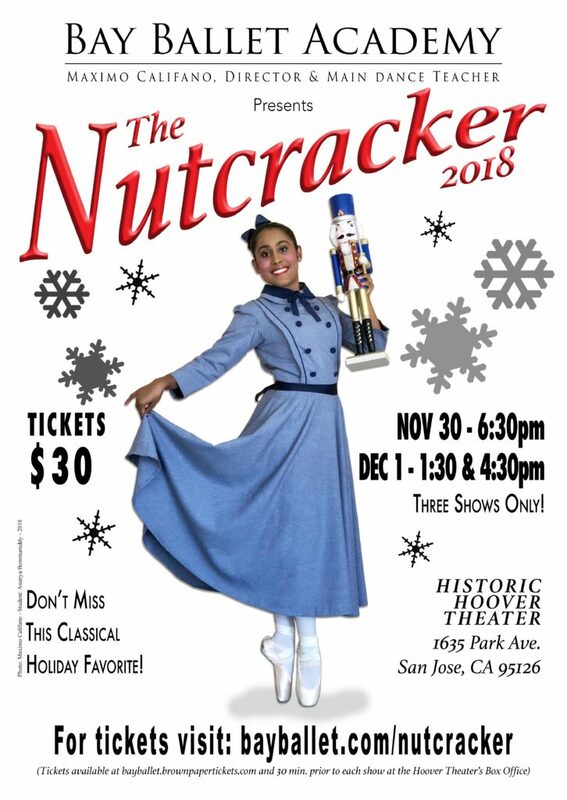 We are excited to announce Bay Ballet Academy’s unique production of The Nutcracker in San Jose. It will take place at the Historic Hoover Theater in the Rose Garden on Nov. 30 to Dec. 1, 2018. Our Nutcracker is a full-length ballet with beautiful dancing, professional dancers, and magnificent costumes and sets that can be enjoyed by the whole family. Do not miss this beloved classic holiday tradition! Friday, November 30 at 6:30 p.m.
Saturday, December 1 at 1:30 p.m. & 4:30 p.m.
Tickets on sale 60 min. prior to each performance at the Hoover Theater’s Box office. Seating is open and tickets can be bought for $25 and $35 at the door or online at brownpapertickets.com The Historic Hoover Theater is a beautiful turn of the century San Jose Dance Theater.